The winter season is officially in full swing and the temperatures are as expected: cold as ice! So naturally, it’s about that time to load up on comfy-chic toppers, and these days we’re relying on Amazon to get the job done since there are countless options to beat the frigid temperatures ahead. The famous E-commerce retailer has a wide range of products up for grabs including cozy jackets that are perfect for the chilly weather. Offering a nice and toasty feel, this pick comes in so many colors and bridges the gap between comfort and style to satisfy all of our needs. So, who is ready to Shop With Us? 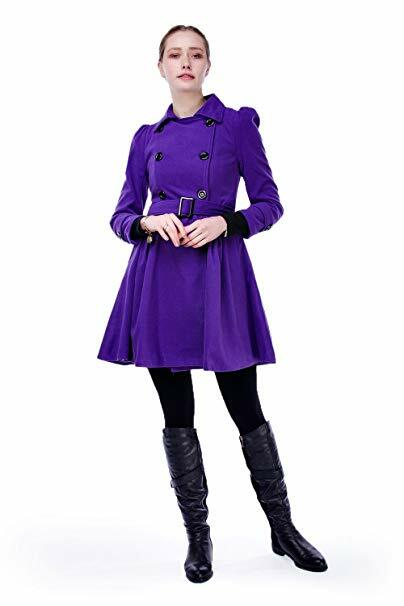 See It: Grab the ForeMode Women Swing Double Breasted Wool Peacoat with Belt Buckle on Amazon for $70 in black, purple, red, shaded spruce and white while it’s still in stock. We are excited to add the ForeMode Women Swing Double Breasted Wool Peacoat with Belt Buckle to our outerwear vault. Boasting a chic fit-and-flare design, this wool coat works to highlight our curves for the ultimate figure-hugging finish. As the saying goes, if you got it, flaunt it! Crafted with a super soft fabric blend, this garment offers that lived in feel that we know and love. There’s a thick belt that nips Us in to give the illusion of a trim waist. Plus, its pleated detailing adds structure and dimension to the silhouette for a chic, yet elegant topper. Complete with a button front, a crisp collar and a storm vent on the back, this piece offers a trenchcoat flair with a touch of femininity for a fabulous staple. If you’re anything like Us, adding a pop of color to your look is a top priority and a red shade never disappoints. Not only is this hue a great festive option, but this offering can easily add an eye-catching element to all of our ensembles. We can even add even more colors to the mix with the green and shaded spruce styles. Our absolute favorite? The purple coat! Known as the shade that represents elegance and poise, this number will look amazing with our dressy and casual ensembles. Versatile in nature, the sky is the limit for the fashion-forward ensembles we’ll be stepping out in. For fashionistas who are obsessed with neutrals, the black and white tones will come right in handy. A great design that can easily complement our closet with ease, we’re looking forward to getting plenty of wear with this wool number. Priced at $70, this layering piece is without a doubt a jaw-dropping steal. While most winter outerwear designs come with hefty price tags, it’s refreshing to scoop up a fashionable find without having to break the bank. We already have a medley of outfits planned for the season and we’re wearing this wool topper with a babydoll dress, pointy-toe pumps and an infinity scarf for our next holiday party. For days when we’re heading to the office, we’re pulling out trousers, a peplum top, a cardigan, a shoulder bag and trendy mules to rule the boardroom in style. We can even step out with this design on our next date night with a miniskirt, tights, a bodysuit, a cross-body bag and our signature red lip to leave our beau swooning. What we love most about this overcoat is that it pairs well with our no-fuss wardrobe with ease. On days when we’re pressed for time, we can easily slip on skinny jeans, booties, a long sleeve tee and a hobo bag for an effortless look. An absolute must-have for our wardrobe, we’ve already made space in our arsenal. Amazon shoppers who purchased this jacket are in love with its fitted construction and soft feel. Many reviewers like that it pairs nicely with all body types for a great inclusive pick, while others appreciate its roomy pockets. Flaunting a warm and thick build, shoppers also dig that this piece is the ideal match for the cold weather. Several shoppers note that this wool find looks just as great on as it does on the model. Dubbed as a fabulous essential for the price, reviewers like that the fabric is durable and strong for a great investment. One shopper also shared that this coat looks amazing with boots and high heels. Sizes S to XXL is currently available. There is no such thing as having too many jackets on standby and this ultrafeminine garment will surely turn heads wherever our day takes Us. See It: Grab the ForeMode Women Swing Double Breasted Wool Peacoat with Belt Buckle on Amazon for $70 in black, purple, red, shaded spruce and white while it’s still in stock. Please note, prices are accurate at the original date of publication, November 30th, 2018, but are subject to change.